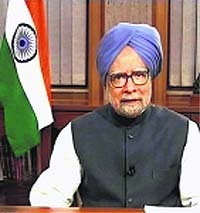 Seeking to address the concerns of the �aam aadmi� and re-inforce his government�s commitment to protect their interests, Prime Minister Manmohan Singh today emphasised that the fresh dose of reforms was required as it was time to take tough decisions given the global economic slowdown. The UPA government was formally reduced to a majority today when the 19-member Trinamool Congress (TMC) withdrew its support to it but the lifeline extended by the Samajwadi Party (SP) has given ruling combine the confidence to concentrate on governance issues and the impending Cabinet reshuffle. Justice Arjan Kumar Sikri has been appointed as the Chief Justice (CJ) of the Punjab and Haryana High Court. At present, Justice Sikri is the Acting CJ of the Delhi HC. The President has also appointed CJs for the Delhi and Kerala HCs. Justice Darmar Murugesan, at present at Madras HC, has been made the CJ of Delhi HC. A complete shutdown was observed on Friday in the Kashmir valley to protest against an anti-Islam video made in the US after the Jammu and Kashmir Government closed educational institutions and imposed severe restrictions on movement to prevent demonstrations in the city. The government today clarified that no excise or customs duty would be applicable on domestic LPG cylinders beyond the cap of six per year. With political uncertainty over Trinamool Congress chief Mamata Banerjee out of the way, next on the UPA government�s radar is to get Cabinet clearance for the controversial Land Acquisition Bill, possibly before October-end. 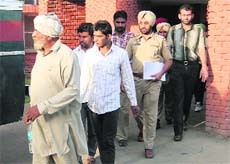 The district and sessions court of Moga has declared 34 Dera Sacha Sauda followers guilty of causing damage to public property and rioting and under various other sections of the Indian Penal Code here this evening.